The Humble Bundle is a new way to buy games. Firstly this is a bundle of games all work on Linux, Windows, Mac OS X and (for the first time) Android phones and tablets. Secondly there is no DRM or restrictions preventing you from getting on any playing the game. Thirdly you get to name your own price for the games. Finally you get to nominate where the money actually goes - you could give it all to charity, or share it between the chosen charities and the developers. The bundle is only available for a short period of time, but then another bundle comes along a few weeks or so later. The games are mainly puzzle / strategy based. A relaxing but challenging physics based floating game. A platform puzzle game where you have to move a chicken around to collect eggs. A tower / bridge building game with flexble goo based creatures. The games are all available on Linux, Windows, Mac OS X and Android. The Android version is a bit different in that some are modified to use just your finger rather than using mouse and/or key controls, but otherwise the games are the same whatever the operating system. In most cases I think that the Android platform works best. As well as being cross platform you can download for multiple platforms. In my case I've installed the Linux version on my laptops and the Android version on my Asus EeePad Transformer Android Tablet. Unlike some software there are no keys to keep safe and it doesn't require you to login before you can play, and no ads or pay for more features. It is not however free or open source software. It's illegal to give or sell copies of the game on, but at least they don't assume that everyone is out to steal the software. One of the great things is that you get to name your own price and so pay what you think it's worth. You also choose who gets that money between the developers, the nominated charities and a Tip (used to support the group that provides the bundles). In my case I paid over double the average price, but did give a bit more of that to the charities. It's a balance between supporting the charities and encouraging the developers to release software through the Humble Bundle in future. The android version works great on a tablet. You do have to enable "untrusted software" as it's not downloaded through Google Markeplace. I've had a few minor problems with the games, but not too difficult to resolve. The first is with Anomaly. On my main laptop I run Linux Mint 12 64 bit, but the debian package only installs on 32bit versions. There is a binary / tar package available, which installs fine, but does not add itself to the start menu (instead just a desktop icon). This copies the shortcut file to the start menu and changes the permissions. There is also a small problem with Edge running on my netbook. It runs fine, but does not set the screen size back correctly when exiting. The easiest way to fix is to press the "Use external monitor button" on the laptop twice, which forces the screen to change back to it's previous setting. These are all minor issues. Considering this software is available on multiple platforms it does very well. You probably don't want to let young children play with Anomaly (because of the concept rather than any actual inappropriate graphics), but the rest are suitable for all the family. My kids particularly like Toki Tori and EDGE, as the others are a little difficult for younger gamers. The games are good and well worth getting hold of. It's unlikely I would have bought them as standalone apps, but well worth it in the bundle. This is the first Humble Bundle that I've bought. I was keeping a look out for the release as I've heard about it during the previous bundle. I was considering buying it based on support for Linux, but having Android as well was a real bonus. Definately well worth considering especially when you consider that it's going to help worthwhile charities. 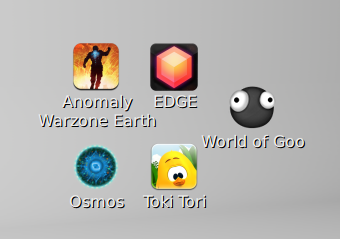 I'll be looking out for the next Humble Bundle when that comes out - especially if that has Android as well.